The Apex development becomes an important new focus in the public realm at a principal new crossing from the City through Shoreditch to Hoxton and beyond. 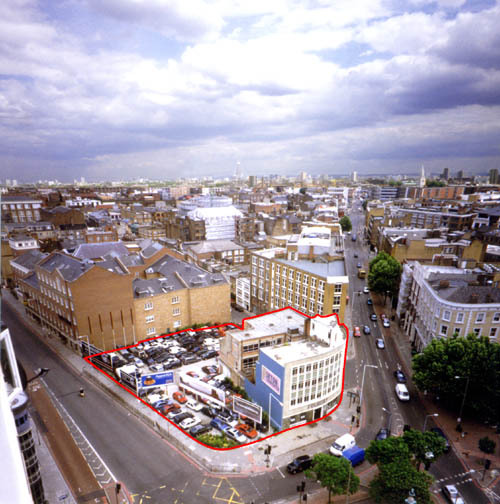 Improvements to the public realm include broad covered pavements along the principal frontages, a new courtyard open to the west, improved highway crossings north and south from the site, the option of two-way traffic in Great Eastern Street and a pedestrianised Tabernacle Square addressing the south aspect of the development. Within the site there is a pedestrian north-south route through the link-block and east-west route across the courtyard. The podium wings extend the prevailing urban grain of the South Shoreditch Conservation Area across the site to the western apex of the Shoreditch Triangle, above which the landmark tower addresses important aspects from Great Eastern Street, Old Street, Rivington Street, Paul Street, Pitfield Street, Tabernacle Street and Tabernacle Square. The horizontal curved prow of the south wing continues the long northeastern frontage of Great Eastern Street, characterized by the bull nosed corners and stripped classicism of mid to late 19th century manufactory buildings. The landmark tower with its tall reflexive curve concludes this Great Eastern Street frontage.